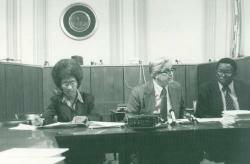 The D.C. Bank Campaign was launched on June 15, 1979 to oppose bank loans to South Africa. Washington, D.C. Councilmember Hilda Mason of the D.C. Statehood Party introduced a bill to prohibit the city from dealing with banks making loans to South Africa. 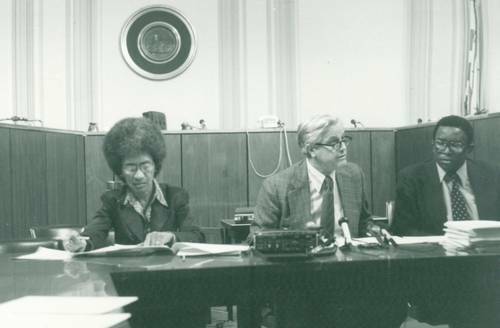 Seen here addressing a meeting on bank loans is Councilmember Mason; Edgar Lockwood, Executive Director of the Washington Office on Africa; and Dumisani Kumalo, national coordinator of the Committee to Oppose Bank Loans to South Africa. Photo courtesy of Edgar Lockwood.